Aidan is a prime. Primes have special powers, but each of those powers comes with a price, a defect that limits the prime in some significant way. Except for Aidan: his multiple prime gifts have not come with any defects, except that he doesn’t sleep. Aidan, in his sleepless hours, meets secretly with General Estrago, who provides him with forbidden books for reflection and discussion, but additionally, Aidan spends his time working through the levels of the simulations designed to prepare each coterie of primes for battle against the Splicers, the creatures that sent this race from their home planet in search of safety. Aidan has reached Sim 299, the top level and a level higher than any other prime. In attempting to conquer the challenges of Sim 299, Aidan must seek the assistance of both his friends and his enemies among the prime coteries, endangering them not only in the simulation but in real life. As the battles become all too real, Aidan uncovers a web of secrecy, betrayal and rebellion at the highest levels. I AM SLEEPLESS: Sim 299 is science fiction for the young adult/new adult reader. It is fast-paced, and the world-building unfolds competently through both the narrative and through ‘quotes’ from a character’s book at the beginning of each chapter. The concept of cohorts of young people being trained for battle is familiar from books such as Ender’s Game, but that very familiarity helps the reader in accepting and believing in the story, which is at its heart a quest story. A couple of things niggled at me. I would have preferred the information about each type of prime, their gifts and defects, to have been presented at the beginning of the book, not at the end: I found that trying to sort out what each prime was capable of distracted me a bit from the flow of the narrative. As well, Aidan’s world contains beasts which are apparently hybrids between (for the most part) familiar animals: the cobramoth for one. These animals are charmingly illustrated in the book (by the author’s wife), but I wanted an explanation for them. Are they genetic modifications? I would also hope for some stronger female characters in the sequel; in this first volume they seemed to me a bit more like adjuncts than full participants in the story. 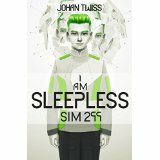 I AM SLEEPLESS: Sim 299 is the first book in a series. It ends with the story not complete: Aidan and his friends have overcome one challenge, but many more lie ahead. The characters and the conflicts presented were compelling; I look forward to the next installment. My overall rating is 3 1/2 stars for this debut novel. The author provided me with a copy of the book in exchange for an honest review. The opinions expressed here are mine alone.